100% Pure Lake Taupo-let's do it! Click here for driving directions to Acacia Cliffs Lodge. Set in a very quiet and private property on 2 hectares of landscaped grounds, our luxury accommodation is only 6 kilometres from the vibrant town centre of Taupo town. Our boutique lodge offers you stunning, panoramic views over Lake Taupo, Mount Tauhara, Acacia Bay, the Taupo township and the snow-capped Kaimanawa Mountain ranges. East-facing, the Lodge enjoys amazing golden sunrises over the mountain ranges and lake and the warmth of all day sun. 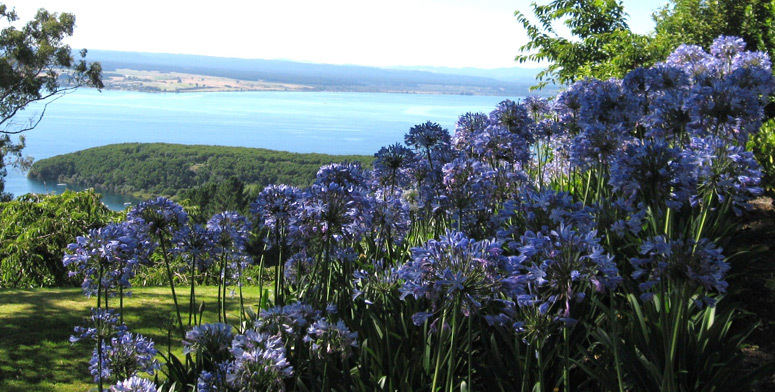 The Lake Taupo region is a lifestyle and adventure destination with a cosmopolitan feel. Halfway between Auckland and Wellington (Taupo lies in the heart of New Zealand’s North Island), our luxury bed and breakfast is an ideal base from which to discover all the region has to offer in any season! Lake Taupo is Australasia’s largest freshwater lake, famous for its world-class trout fishing and surrounded by some of the world’s most beautiful unspoilt natural scenery. In this volcanic wonderland, you’ll find snow capped mountains, pristine native bush, gin-clear rivers, steaming thermal areas and one of the world’s only Dual Heritage National Parks. Click to here to find out more about the many things to see and do in Taupo. Click here to view images of our boutique accommodations and lodge.